The voltage generated by thermocouples is very small. They are in the order of milivolts. In the application of thermocouples to measure temperature, it is often required to convert the milivolts signals of thermocouples to temperature values. To aid this conversion, several milivolts voltages for the different types of thermocouples are tabulated against known standard temperatures. With these thermocouple reference tables, it is then easy to determine any given temperature for known milivolts values. Thermocouple reference tables are based on a reference junction of 0 degree C. If the reference junction is not at 0 degree C, then a correction factor must be applied. Locate the milivolt reading in the body of the table, and read from the margins the temperature value. a straight line approximation (or interpolation) can be made between two values. Interpolation takes into account the proportionate part of the difference between the two values read from the table. The little sketch below illustrates how the interpolation method, which is more accurate, is used to arrive at temperature values. The values of VH, VL, TH and TL are read from the thermocouple reference tables. Interpolation is then done using the formula above to determine the more precise temperature. A voltage of 14.82mV is measured with a type J thermocouple with a 0 degree C reference temperature. Find the temperature of the sensing junction. 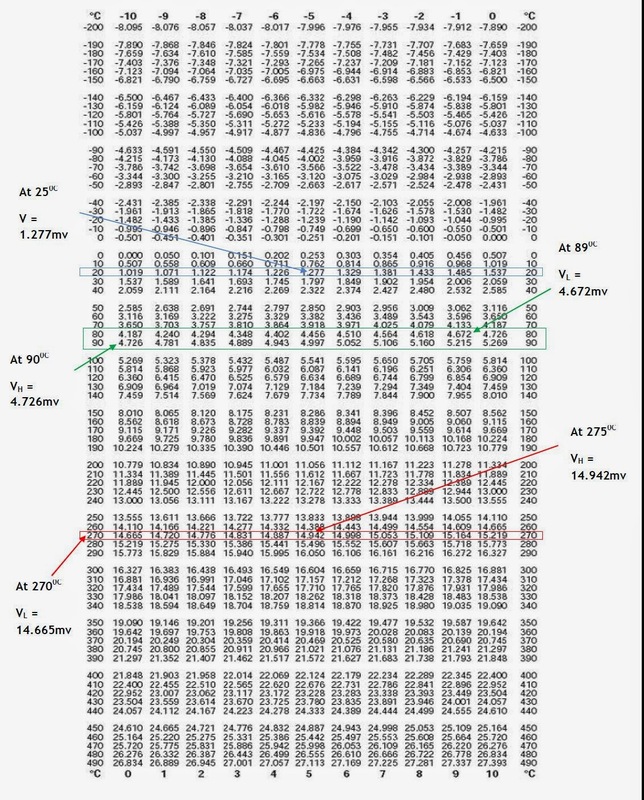 From the reference table for J-type thermocouples above, it is found that VM = 14.82mV is between VL = 14.67mV and VH = 14.94mV(the red box and red arrows) These voltages have corresponding temperatures of TL = 2700C and TH = 2750C. Select the correct reference table for the thermocouple type in use, i.e. J,S,T etc. Locate the milivolt reading for the reference junction in the body of the table, and read from the margins the temperature value. Add this milivolt reading to that measured by the instrument. This corrected milivolt reading can then be converted, using the thermocouple reference table, into measured temperature. A voltage of 3.444 mV is measured with a type J thermocouple with a 25 degree C reference temperature. Find the temperature of the sensing junction. The voltage of the reference junction at 25 degree C, from the J-type reference table is 1.277mV(the blue box and blue arrow). From the J-type thermocouple reference table above, VM = 4.721mV is between VH = 4.726mV and VL = 4.672mV corresponding to TH = 900C and TL = 890C (the green box and green arrows).